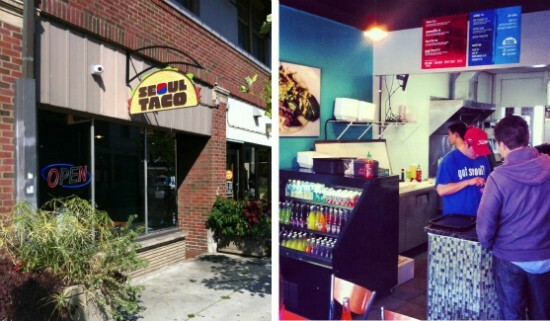 The exterior (left) and interior (right) of Seoul Taco's new brick-and-mortar restaurant. 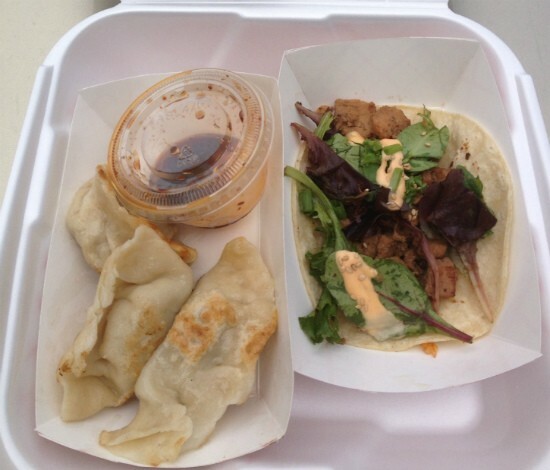 Seoul Taco (571 Melville Avenue, University City; 314-863-1148), the Riverfront Times Best of St. Louis 2012 readers' pick for "Best Food Truck," has put down permanent roots with last week's opening of a brick-and-mortar location in the Delmar Loop. See Also: - "RFT vs. Our Readers: Best Food Truck"
Seoul Taco owner David Choi and his business partner Andy Heck weighed opening a bricks-and-mortar establishment to begin with, but chose instead to start with a food truck. Among the advantages provided by the new restaurant space: It will serve as the truck's commissary. "It's gonna be a lot more different," than the truck, Choi says about the restaurant space. "At the soft opening, we were able to go through tickets so much faster because we designed the space ourselves. And with the food truck we bought it as-is and have to operate what we're given. "Efficiency-wise, it will be better, and since we'll have more room we can expand our menu a little bit more. We released our burrito that we had [at the soft opening] and everyone loved it." The rest of the menu has all of Seoul Taco regulars' favorites: tacos, quesadillas and the ever-popular "Gogi Bowl" (meat and veggies over rice with hot sauce and a fried egg), as well as pot stickers. Choi hints at more additions to the meu, but says the restaurant will slowly add new items, "over the next few months." The Seoul Taco team is already looking ahead to 2013, and Choi admits that he and Heck are very thankful to be in their current position. "We didn't even expect to have a brick-and-mortar place at the this point," he says, humbly, and references how quickly people took to the truck. "If this goes well, we definitely want to have one more truck in St. Louis and maybe look to other cities as well."